CREW Network publishes annual white papers. 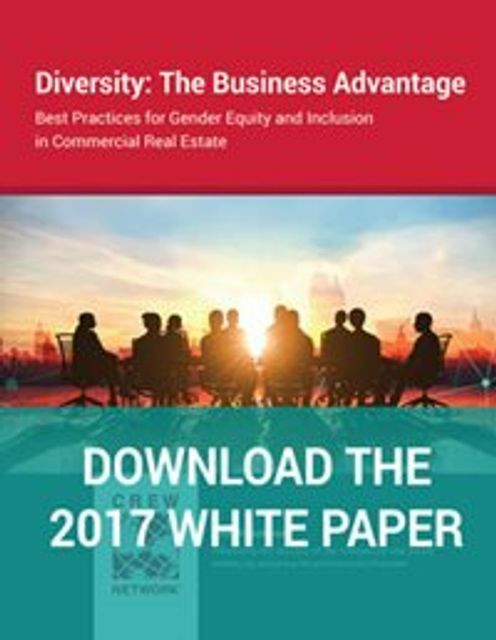 This year's research centered on diversity, as there are large gaps in the genders represented in the commercial real estate industry, as well as both a wage gap and an aspiration gap. The research also unearthed tips and action items that any organization can take away: from leadership engagement, written objectives, accountability, honesty about unconscious biases and evaluation of recruiting processes. After reviewing hundreds of testimonials and conducting extensive research, CREW Network selected 10 companies in the commercial real estate industry in Canada, the U.K. and U.S. to profile for case studies in 2017. Each of the companies have benefitted from improvements in gender equity and more diverse workforces. Many have seen increases in profits and stock performance. Others have been more successful in recruiting and retaining women. All have experienced gains from the greater creativity, critical thinking and innovation that comes from diverse teams.